Trashman 1 was my 1st recycled instrument. 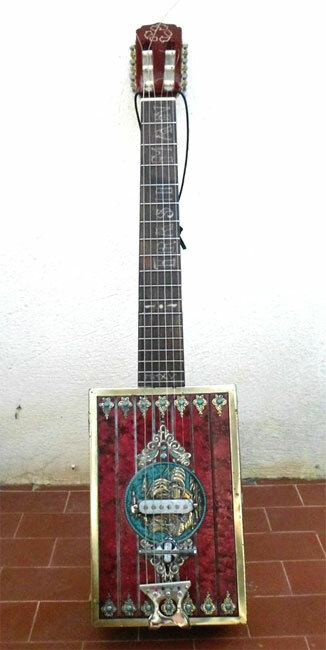 It's more of a canjo than a cigar box guitar. I found the neck of a classical guitar broken in Piazza San Domenico in Napoli, inlayed the fingerboard and attached it to an antique candy box. The tailpiece is a potato peeler and the bridge is a large bolt laid into an epoxy paste base with a home made pickup made from a watch speaker. There's also a battery powered distortion pedal built into it.